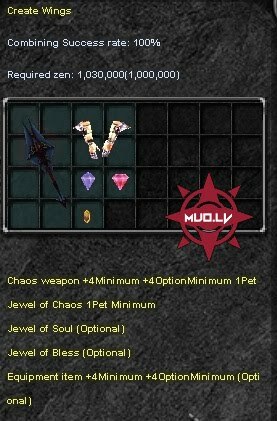 To create a chaos item you need to put in the Chaos Machine 1 Jewel of Chaos + items upgraded to +4 or more, with option +4 or more (Jewel of Life), optional 1 Jewel of Soul, Bless. The more upgraded items you put in the machine, the bigger the chance of success. Good way to obtain items for combinations is to collect Heart of Love. A successful combination produces a Chaos Dragon Axe, Chaos Nature Bow or Chaos Lightning Staff. If your combination fails your items will be downgraded. 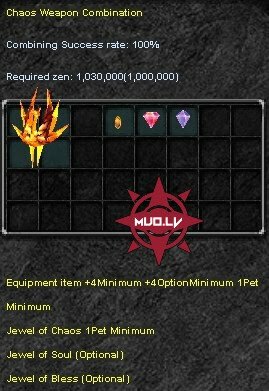 The next step is to upgrade your Chaos Item to +4 with a +4 option or more (Jewel of Life) and place it in the machine with another Jewel of Chaos. Again you can use upgraded items to increase your chance of success. 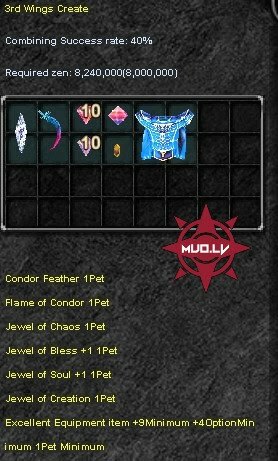 Optional Jewel of Soul, Bless. After a successful combination you will recieve level 1 Wings. 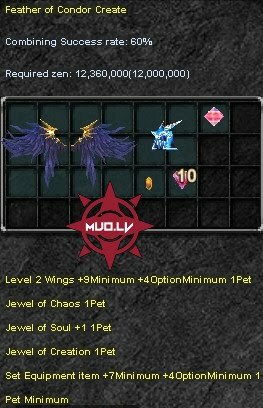 Note that the type of wings does NOT depend on the type of Chaos item. Fail to combine the items you can lose the items. 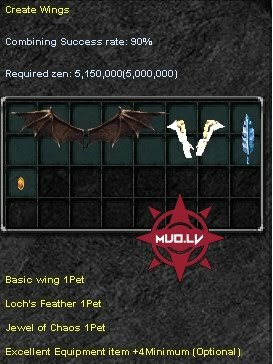 To make level 2 Wings or Cape of Lord, upgrade your level 1 Wings to +4 with a +4 option or more and place them in the machine with another Jewel of Chaos and 1 Loch's Feather (dropped in Icarus) or Chrest of Monarch for Cape of Lord. This time if you want to increase your success chance you cannot use normal upgraded items. Insead you need Excellent Upgraded items to get a better chance of making level 2 Wings. After a successful combination you get a pair of level 2 Wings. The type of level 2 Wings does NOT depend on the type of your level 1 Wings. Fail to combine the items, you can lose them. To make level 3 Wings or Mantle of Lord, you need to create a Feather of Condor. Place your level 2 Wings+9 with a +4 or more (Jewel of Life), 1 Jewel Of Creation, 1 Jewel of Chaos, 1 pack of 10 Jewels of Soul and 1 Ancient Item+7 +4 or more. On success you receive a Feather of Condor. Note that the maximum combining success rate is 60%. On success you receive your 3rd level Wings. Note that the maximum combining success rate is 40%. If the combination fails you lose everything!